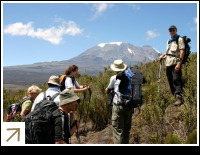 We have safaris and holidays running in all of the key destinations in sub-Saharan Africa - just click on the destination that interests you. If one country in Africa could encompass everything this great continent is famed for, that country would be Tanzania. From stunning safari destinations packed full with African wildlife, to the rainforests made famous by Jane Goodall, and exotic Zanzibar in the Indian Ocean - you could say that Tanzania has it all. South Africa has space – lots of it. Luckily that space is filled with some of the most beautiful scenery in Africa, studded with great cities and fringed by the most incredible coastline. Most visitors visit Cape Town and take in a safari at Kruger or one of the many other game reserves, while others opt for the cultural and scenic delights of the Winelands and the Garden Route. Other southern Africa destinations include Botswana, Zimbabwe and Zambia. Contact us for details of our tours. 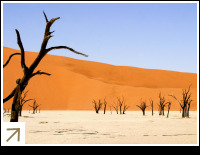 Think of Namibia and think of stunning sand dune landscapes, the endless expanse of the Namib Desert and the ethereal Skeleton Coast. No other does eerie desolation like Namibia does and there are plenty of ghost towns to explore. But that’s only one side of this country, the other is all about the vibrant fun to be had in Swakopmund, incredible safaris ain Etosha and the awesome terrain of the Fish River Canyon. Until recently Rwanda was in the news for all the wrong reasons. But now, thankfully, this little gem of a country is bouncing back and welcoming visitors with open arms. Many come to see the mountain gorillas which live in the rainforests. These are critically endangered and their protection is paramount, so numbers are strictly limited. The fees you pay goes for the continued conservation of these gentle giants and we also have a tour in Uganda to see the gorillas living there. Once upon a time Mozambique was an off-the-beaten-path kind of place that was more or less closed to visitors. Those days are now well and truly over and the country is one of Africa’s hottest new destinations. 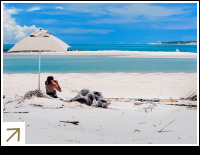 Hundreds of miles of beautiful beaches await the traveller and better connections make it easy to reach from South Africa. Come for the beaches, stay for the friendly people and the beautiful scenery.